When the free non-production Domino server license was launched on developerWorks earlier this year, it brought that area of developerWorks to the conscious awareness for possibly the first time. I looked at the "Communities" sub-page and, in particular, the "Social" area near the bottom on the right. That highlighted that there were Twitter feeds being publicised that were not being maintained. That needed addressing. 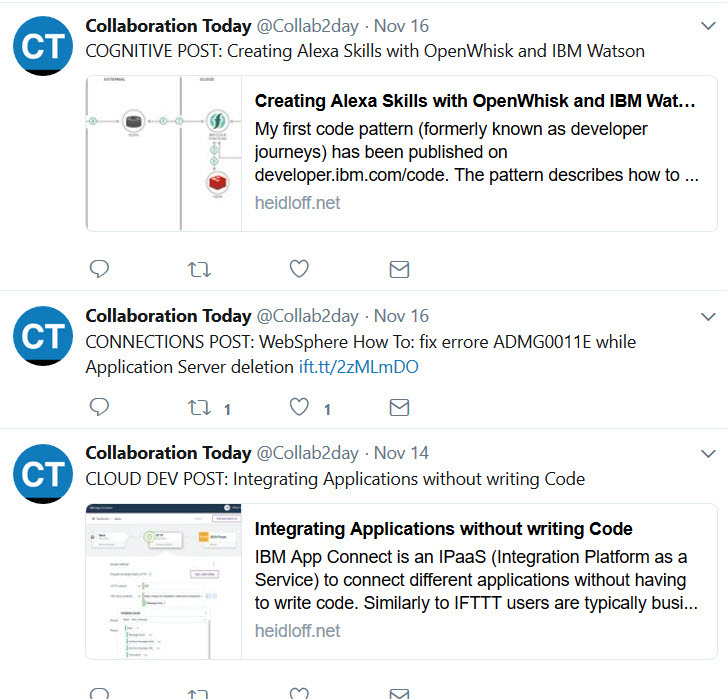 CollaborationToday has a team curating the content that appears there in a variety of categories and the Home Page of OpenNTF has a widget that displays new releases. There is content that could and should easily be blogged by @Collab2day and @OpenNTFProjects. But we're all busy people and we endeavour to work smarter. There are tools to automate posting to a Twitter account and one of those that I've been using since the end of last year for various integrations is IFTTT. For those who haven't used it, IFTTT allows you to set up "recipes" which will perform some action based on something else occurs (IF This Then That). Two of those endpoints are an RSS feed and Twitter. So for a few months now we've had various recipes so that if there is a new feed item, IFTTT will automatically post a tweet. 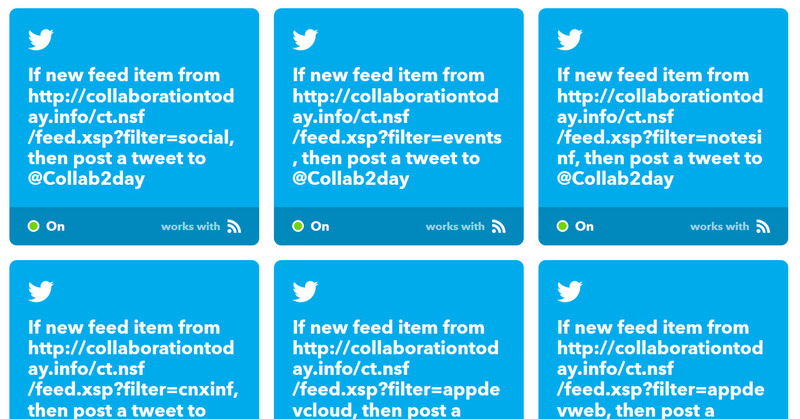 But CollaborationToday includes a variety of categories and few will be interested in all categories. So to make the tweets more useful and more informative, there are different recipes for each category, adding a prefix to the tweet depending on the RSS feed category filter, as you can see below. Currently there is no RSS feed for new project releases, so that is proving less straightforward to automate. But obviously that's feasible, it's just going to take some custom development. UPDATE: As a duplicate tweet just reminded me, I also set up an IFTTT recipe for the main OpenNTF account to automatically tweet new stories via the OpenNTF Blog RSS feed. The lesson to learn is automation is great until you forget what you've automated!